Enjoy A Mess Free Desk With A Sleek Desk Wiz File & Folder Organizer Holder! If your desk has too many piles and papers sitting around. If you can't even see the surface of your desk. If it takes you too long to find what you are looking for. Then it's high time you did something about that! Invest in a Desk Wiz desktop organizer today! Aesthetically please your office, keep your life organized and everything you need close by. Less time searching. Less time rearranging. More time being productive. Yeah we know! It's easier said than done! But with our Desk Wiz file holder, desk organization is taken to a whole other level. Just organize your desk once and with a little bit of maintenance, you can enjoy a flawless desk for many years to come. Explore its 3-tiered nature today! With 3 horizontal shelves and 2 vertical compartments, this desk storage holder is a keeper. Being compact, lightweight and easily portable, our file organizer tray goes everywhere you go. Ideal for home, office, school, classroom, receptions, bars and restaurants, business, dorms and your study room of course. Unisex and fashionable black wire mesh, suitable for men, women and teens. · ... papers, magazines, books and notes! · ... staplers, binders, clips or tapes! · ... arts and crafts supplies. · ... memos, letters and year planners. · ... pens,highlighters, pencils, erasers and sharpeners. · ... small electronics, gadgets and your phone! · ... pretty much anything that comes to mind. Are you ready for an organized and impressive desk? HOLDS ANYTHING YOU WANT: Our desk organizer file sorter, has 3 horizontal trays and 2 vertical storage compartments. Being free standing and compact, it can hold anything. From paper, mail, letters, documents, manila folders, envelopes, to stationery, notepads, homework, notebooks, notes and magazines. NON-SLIP - STURDY - DURABLE: Mounted rubber pads at the bottom make this stand EXTRA sturdy, minimize slipping and protect your desk from scratches. 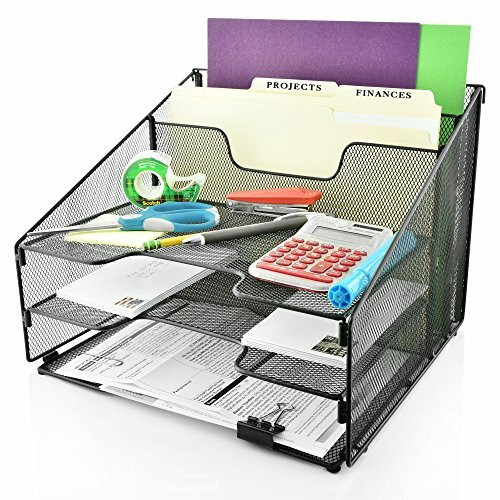 Made of high quality metal mesh wire, this desk organizer tray can withstand everyday wear and tear. RISK FREE PURCHASE - FAST AND EASY ASSEMBLY: Backed by our 30 day money back guarantee, you can get this 5 section computer desk organizer risk free! It comes with a user friendly manual. Enjoy hassle free and quick assembly in less than 2 minutes. BECOME AN ORGANIZATION WIZARD: Looking for ways to organize your table and facilitate your life as well? If so, then a 5 compartment Desk Wiz is what you are looking for. Keep your things in order, store your supplies and find anything you need faster. Make a good impression at work or teach your home about the importance of organization! MAXIMIZE YOUR DESK SPACE: Whether you are a school teacher, student, manager, business executive or receptionist, this desktop file sorter is an absolute must have addition to your office organization arsenal. Combining an elegant black wire, impeccable style and great craftsmanship this desk organiser will complement your office and keep everything tidy. If you have any questions about this product by Desk Wiz, contact us by completing and submitting the form below. If you are looking for a specif part number, please include it with your message.